The people of Greensburg lost everything, or so it seemed to me as an observer. Yet they were grateful for what they had – their lives, their families, and each other. What impressed me most about this rural Kansas community was the incredible human spirit. These hardy individuals rose to the occasion. Despite their loss, the townspeople stood strong. From across the nation, they were surrounded by strangers who were united in one common cause – helping the storm victims to heal and to rebuild their lives. 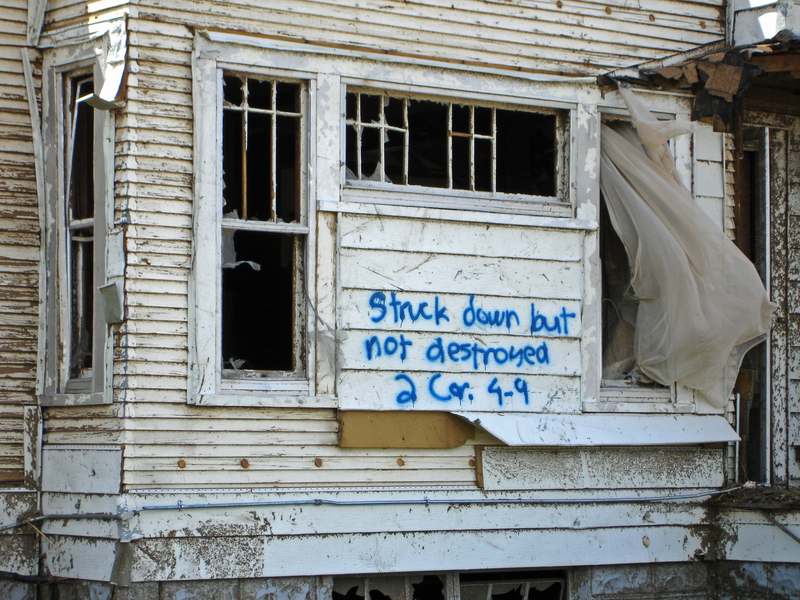 "Struck down but not destroyed"
People came together to do what they could. If they couldn’t provide a direct service or clean up debris, they helped someone who could. Everywhere I saw evidence of the connectedness of this community. As I drove 30 miles each morning to get to my “office” at headquarters, I would listen to local radio stations conducting their own fundraising drives for the Red Cross. In the parking lot of the Presbyterian church, people were selling home-baked goods, potted plants, and crafts. A young girl set up a lemonade stand and raised several hundred dollars to benefit the Red Cross. In addition to a corporate gift of $80,000, local Wal-Mart employees personally collected $20,000 for the Red Cross. Although the Red Cross literally took over the United Methodist church to coordinate our relief efforts, the congregation and pastoral staff genuinely appreciated our presence. On Sunday morning children in Sunday School classes made Mother’s Day cards and gave them to each of the Red Cross women who were away from their own families on that special day. Each day at the church, we Red Cross workers were served hot meals prepared by community church groups representing various denominations. With their own food, these good-hearted folk from the community came into the Methodist church to prepare and serve our meals. The Red Cross has considerable experience in all types of disasters. We plan and prepare for the unexpected, and literally within hours of the tornado we were in Greensburg providing emergency assistance. In two nearby towns we set up shelters in high school gyms. Many Greensburg residents found lodging there until they could make other arrangements. In addition to the emergency shelters, we also set up service centers. Here people came to receive financial aid, casework assistance, counseling, medications, tetanus shots, and personal care supplies. Bulk distribution sites were also set up. There people picked up food, bottled water, sunscreen, insect repellant, gloves, rakes, plastic trash bags, bleach, 5-gallon pails, and other cleaning supplies. From throughout the Midwest we brought in ERVs – emergency response vehicles. These are Red Cross vehicles built on an ambulance chassis. From these vehicles we provided mobile feeding – driving around Greensburg serving hot meals and bottled water to residents cleaning up their property, contractors working within the restricted zone and various law enforcement personnel assigned to the disaster. 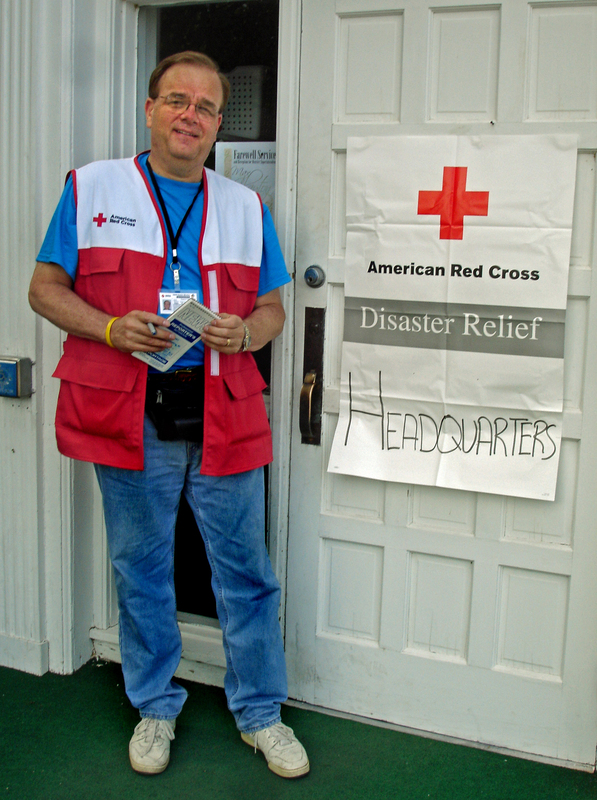 My job as a a Public Affairs officer was to inform people how they could either give or get help from the Red Cross. 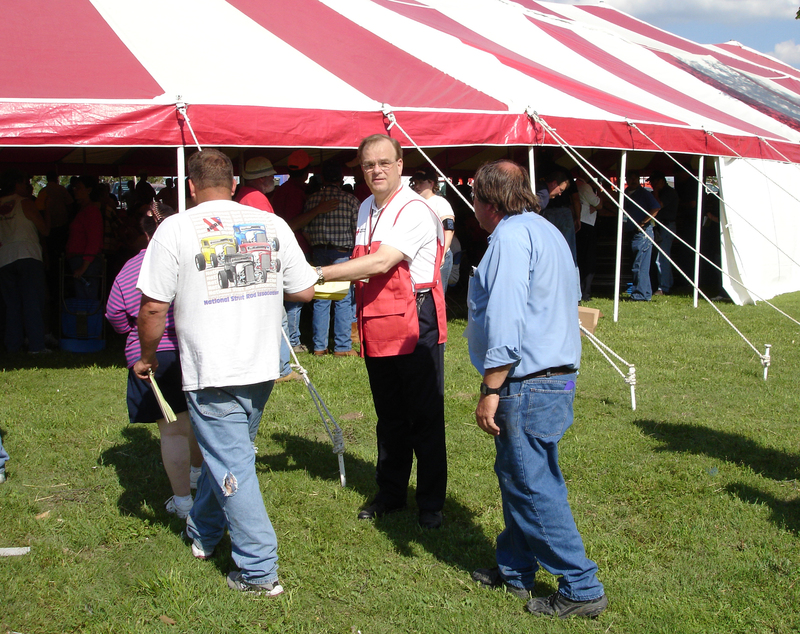 Specific activities included writing news releases announcing the locations and hours of service centers, distributing flyers to the residents of Greensburg as they came together at a town hall meeting, being interviewed live on the radio, talking with newspaper reporters, handling TV news crews coming into the Red Cross shelter, giving tours of Red Cross operations to major donors and VIPs and meeting with the highway patrol to update the information being broadcast on the 1610 am emergency radio station. Inside our shelters, real people have real lives. Inside our lodging accommodations in the gym of a local high school, I observed the wheelchair of an elderly woman. She was lying there on her green canvas cot. She lost her home in the tornado and had found refuge in a Red Cross “motel.” I also watched as a pregnant woman walked to the dining area. A week earlier, she had lived in Greensburg. Many of her dreams for the future were now destroyed, and I wondered where she and her family would live in the weeks and months ahead. Despite the human suffering, stories of hope and celebration abound. One such story centered on a man named John. He and his wife were living in the Red Cross shelter. On Friday, the one-week anniversary of the tornado, John planned to quietly mark the 90th anniversary of his birth. 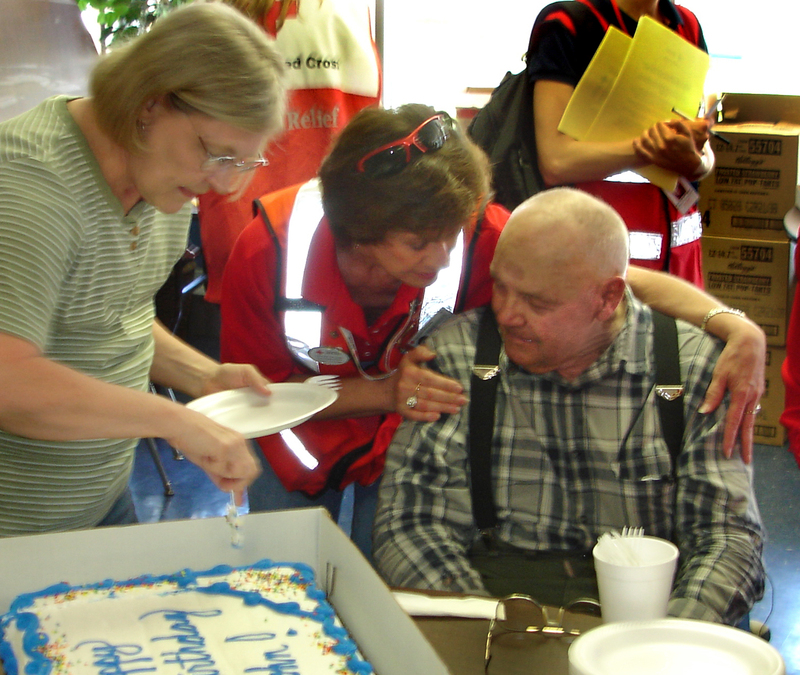 Upon learning of his upcoming birthday, a Red Cross worker decided to somehow bake a birthday cake. Catching wind of this plan, an NBC news reporter asked if she could provide the cake. I first heard of the surprise party only 45 minutes ahead of time. I was escorting Wal-Mart executives from Bentonville, Arkansas who had flown in on their corporate plane. After presenting the Red Cross with a generous check, they were touring our operations centers and were on their way to the tornado site. I phoned ahead to alert the shelter manager that we were on our way. As the Wal-Mart people in my car overheard my conversation, they asked if they could present the man with a birthday gift. They phoned back to the local store and had an employee speed to the shelter with a $300 gift card. Minutes later we were all huddled around John and his family singing “Happy Birthday.” He was so touched that he put his head into his hands and cried for an uncomfortably long period of time. His granddaughter commented that she had seen her grandfather cry only once before. On Friday night, one week after the tornado struck, Greensburg residents returned to their community for a town hall meeting. This was the first time they had to come together since the tragedy. The only place to meet was in the city park under a huge tent. As the townspeople gathered, I was among a handful of Red Cross workers who greeted them and passed out flyers telling how they could contact the Red Cross to receive services and financial assistance. Immediately, hundreds of town folk rose from their folding chairs and gave us a standing ovation. According to the newspaper report, the applause lasted for more than a full minute. As I stood on the perimeter of the tent, I looked into the moist eyes of the volunteers by my side. I also felt a huge lump in my throat as I realized that this applause was coming from people who had lost all their material possessions. Yet in gratitude they rose from their seats to express heartfelt appreciation. What a memorable moment! Years from now, that is the memory from Greensburg I cherish most. This entry was posted on Tuesday, May 4th, 2010 at 12:30 pm and is filed under Life in General, Marketing & Strategy. You can follow any responses to this entry through the RSS 2.0 feed. You can leave a response, or trackback from your own site. Ah, my first encounter with you, friend. I am so glad you were able to come to Greensburg and be a part of our team. Your knowledge, talent and presence were so very appreciated. I am so blessed to have met you! Andrea, I first saw you on CNN. Then, a couple days later, there we were in Greensburg working together on the “Public Affairs Dream Team.” We worked some very long hours, but I cherish the memories of 1) the difference we made in the lives of the people affected by the disaster and 2) the difference they made in our lives. It was all a very worthwhile experience.